Details of the RHS Garden co-designed by HRH The Duchess of Cambridge for the world-famous RHS Chelsea Flower Show (21-25 May 2019), sponsored by M&G Investments, have been revealed. The RHS Back to Nature Garden, designed by The Duchess of Cambridge and award-winning landscape architects Andree Davies and Adam White of Davies White Landscape Architects, is based in a woodland setting as a space for families and communities to come together and connect with nature. Key elements of the garden include a beautifully crafted hollow log for children to climb through, a den, waterfall, stream and tree house. The tree house will form the centrepiece of the garden and will feature a swing seat hanging from the branches, creating a place for children and families to play together. The waterfall and stream will also encourage play – from floating Poohsticks and chasing them along the stream to making dams with stones and sand to attract more wildlife. Wild trees and shrubs combined with a cool, calm colour palette of green and blue provide an instant 'nature fix' to relax and calm, while the playful and diverse planting includes edibles, plants for craft activities and forest scents, ranging from tiny wild strawberries to magnificent trees. This space isn't just for people either – the flowers, fruits and seeds provide food for wildlife and nectar for bees and butterflies, while the plants offer nesting sites and shelter for birds and other animals. Sue Biggs, RHS Director General, said: “We couldn’t be happier with the wonderful design by The Duchess of Cambridge and Andree and Adam for our garden at Chelsea this year. “The RHS’s Garden is a beautiful natural space for families to get together, play, dig, grow plants, connect with nature and spend time in the great outdoors – something core to us as a charity to promote, inspire and encourage people to do. 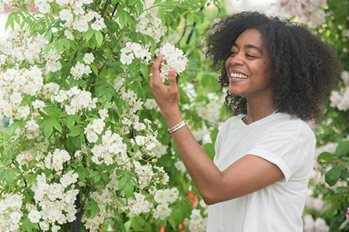 The RHS Back to Nature Garden is part of the RHS’s partnership with NHS England, which promotes the physical and emotional wellbeing that access to green spaces and gardening provides. After Chelsea, some of the planting and landscaping will go to an NHS Mental Health Trust, as part of a national competition run by the RHS. Continuing the collaboration and to engage even wider audiences, The Duchess of Cambridge and Davies White will be co-designing two further RHS Gardens, maintaining many of elements from the Garden at Chelsea, at RHS Hampton Court Palace Garden Festival (2-7 July 2019) and RHS Garden Wisley in Surrey, which will open in the autumn later this year.